I find this a really difficult book to review. I loved the first book and was so happy to get the latest in the series. This was completely different, and whilst I liked the story as a whole, it was an incredibly slow read. The surfer setting was fun, but maybe as a non-surfer I couldn't entirely get into it the level of detail. I honeymooned on Maui, so I enjoyed reading about a place I remembered – although I was mostly blind to the racism that is so evident in this story. It evoked perfectly the amazing mixture of wild, both mountain and shore. For reviews & more info, check out our Heartbreaker post. Be sure to visit Kat & Stone on their Facebook page today to enter. 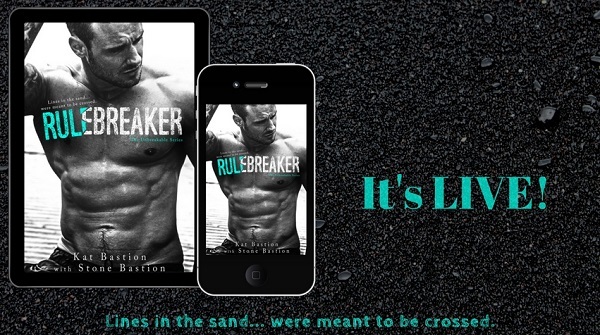 Reviewers on the Wicked Reads Review Team were provided a free copy of Rule Breaker (Unbreakable #2) by Kat Bastion & Stone Bastion to read and review for this tour.